Authentically Emmie. The Anti-Jared. No Thanks to Cake. 300 Pounds and Running. The Double Chin Diary. Coffee Cake and Cardio. 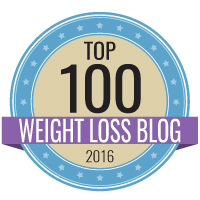 Those are just some examples of bloggers who have for years been the go-to’s for weight loss and healthy living inspiration. And rightfully so. They’re the leaders in the field, people who have put themselves and their personal journeys out there for the world to see, day-in and day-out. Along the way, they have picked up hundreds of thousands of readers who go to them for motivation, for resources and even just to connect with someone who understands the struggle. But what about those lesser-known bloggers? The ones who aren’t on the front page of Google search results for “weight loss” or “healthy living” bloggers, but who also spend countless hours writing out their innermost feelings, sharing secrets to success and putting it all out there in hopes of achieving wellness? They deserve love too. That’s why we put together a list of the top 100 inspirational bloggers you probably have never heard of. Some of them are brand new to the world of blogging. Others have been blogging for a few years, but recently shifted their focus to healthy living or weight loss. And others are just ready to share amazing things with you to help you along in your journey. Whatever your reason for needing to find a blogger who can inspire you — be it for weight loss, fitness, positive body image, healthy recipes, you name it — you’ll find that someone right here. About: Rhiannon is a native of North Wales. She’s an avid YouTube vlogger and stocks her blog with posts that run the mill, from fashion and travel to her love of photography and very real effort to stay fit. Rhi’s strength is taking you step-by-step with her as she continues to challenge herself in new ways to keep the weight off. Top Quote: I hope that you will join me on some of my journey, and maybe, just maybe I might help someone else who is losing weight into the bargain. Top Post: What game does your life mimic? Top Post: So What’s So Wrong with Hard? Top Post: What’s More Important — Diet or Exercise? About: If you’re not sure what to eat to lose weight, and still want it to taste good, Jennifer’s blog is for you. She’s a professional weight loss coach, and her blog is loaded to the tee with healthy recipes, tips and much, much more to help get you to your ultimate goal: shedding pounds and still enjoying life to its fullest. Top Post: You’re not obese, you’re [insert compliment here]. About: Skinny Ms is a one-stop shop for all things you could possibly need (or want) for weight loss and healthy living. It’s packed to the tee with tips, fitness, recipes, even meal plans to help you on your way to a new you. Top Quote: “I have so many steps ahead of me, and this will be an ongoing battle the rest of my life, but I know that it is possible, even when it seems like the scale gets stuck for months at the same weight no matter what I do." Top Post: 103 Pounds Lost: Gotta Get it Right! Top Quote: “I am the only person who puts food in my mouth.’ I really like that because I frequently find myself looking for someone else to blame. If I have to take responsibility -- well, maybe I'll rethink it." Top Quote: “I exercise, I try new things. I’m sorta into kale. Sometimes I trip over my own shoelaces and sometimes I set a new PR. If I get up at 5am to workout it’s under duress. 79. Live Fit. Live Healthy. Live Free. Top Quote: "Success breeds success. I can’t believe how hard it is and how much mental work it takes to get myself back on track after even one meal off my diet. The more I see this, how quick my MOJO can be smashed to freaking hell the more awareness I have. Diet-to-Go further refined its search to include only bloggers who had shared a post within the last 90 days. Category, ensuring blog was primarily focused on healthy living; weight loss; fitness; healthy eating/cooking; positive body image. Quality of posts, including use of photos and writing style. Interesting information in “About” section. Pages with the highest number of visits besides the home/main pages of website. Pages that related to weight loss & healthy living. And for the “Top Quote,” we just picked the words that inspired us, and hope it will do the same for you.